18 months ago, a mountain bike accident left Andrew Garey with a broken neck and a hair’s breadth from life as a quadriplegic. 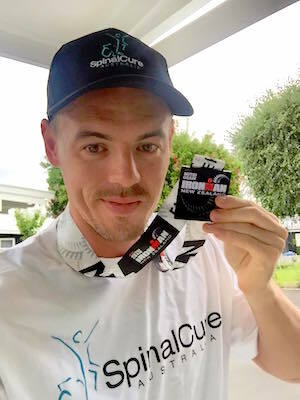 With support from his family and friends, and a long hard rehab program, Andrew is now back on his feet — so much so that he and his brother Chris took on the Ironman NZ triathlon at Lake Taupo to raise funds for SpinalCure. After a superb effort Andrew had to pull out before the end, leaving Chris to finish the gruelling race. The brothers raised over $3,500 for research! Well done and thank you. Pictured: Chris Garey after finishing the race.